Kaplan and Norton’s Balanced Scorecard (BSC) is increasingly the strategic business tool of choice for many organizations. One of the four components of the BSC, “Learning and Growth” is misunderstood, underutilized, and ineffectively applied. The BSC framework provides an opportunity for management and workplace learning and performance professionals to communicate through a common language, establish realistic and measurable targets, and align and support the rest of the organization in a strategic way. This book provides proven guidance and customizable tools to measure the role of learning and performance, link it to organizational objectives, and communicate to management results in a common language. This highly accessible, comprehensive resource shares the passions and key lessons from an all-star cast of respected training professionals. 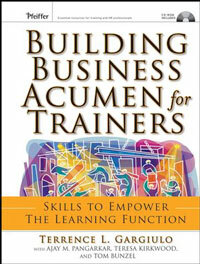 The authors covers a range of training topics, from designing, writing, delivering, measuring, and managing training to developing business acumen. 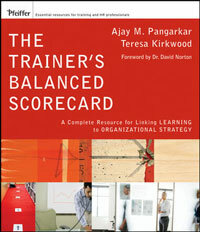 They have divided the book into five sections (Designing Training, Delivering Training, Workforce Performance and Learning, Measurement and Evaluation, and Professional Development), including over 60 articles as well as additional resources on a special Web site; helpful checklists, case studies, and assessments throughout; and an easily customizable CD. The Trainer’s Portable Mentor is ideal for anyone new to the field of training and development as well as veterans looking for succinct practical nuggets they can put to use right away.